Mainz - Eight stodgy minutes into 1. FSV Mainz 05's Matchday 10 meeting with Eintracht Braunschweig, the hosts came up with a thing of a beauty. Left back curled a superb long pass in behind the guest defence and met it first-time on the bounce with an improvised chip over the head of Eintracht keeper to send the home crowd into early raptures. It was just the start Mainz were looking for against their cellar-dwelling visitors from Lower Saxony. Having begun the season strongly, they went into Saturday's encounter with newly-promoted Braunschweig without a win in any of their previous six outings. This was the perfect opportunity to haul themselves out of that rut but they failed to capitalise on their early advantage, leaving the game balanced on a knife-edge until, with just over 20 minutes to go, Okazaki finished off a lightning-fast breakaway to effectively seal three badly-needed points for Thomas Tuchel's side. "There's nobody who'll begrudge him that," the head coach said afterwards of the hard-running 27-year-old Japan international's first brace in his 72-game Bundesliga career. The man of the hour clambered up the fence at the home end to conduct the obligatory post-match celebratory sing-song and admitted afterwards: "It was a fantastic feeling when the fans were chanting my name." A fantastic feeling for sure, but no doubt one of relief as well based on what sporting director Christian Heidel’s had to say: "If Shinji doesn't score, he feels like he hasn't contributed.” It implies a considerable amount of frustration for a player who had only netted once in the Bundesliga this term prior to the double against Braunschweig - and once in the entire 2012/13 campaign for his previous employers VfB Stuttgart. All the more so given that the man from Takarazuka, north-west of Osaka, has averaged nigh-on a goal every other game in over 70 appearances for the national team - for whom he is set to play a pivotal role at next summer's FIFA World Cup finals in Brazil. By any measure, his own included, Okazaki had few grounds for self-reproof in the wake of his latest matchwinning turn. In common with so many of his compatriots now earning their crust in the Bundesliga, he made a polite point of stressing how happy he was above all to have been able to help the team when speaking to the press after the game. 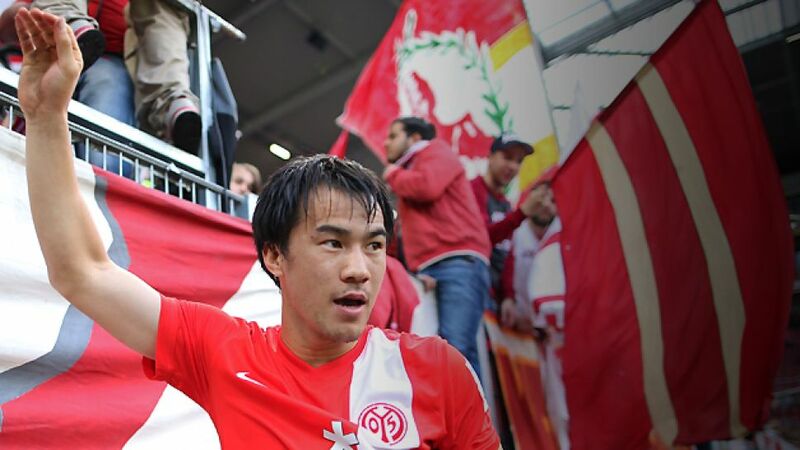 A follow-up success at FC Augsburg this Sunday could well lift Mainz back into the top half of the table - and if Okazaki can chip in with another goal in the process, it should ensure a satisfactory day's work all-round for FSV's new far eastern forward star.